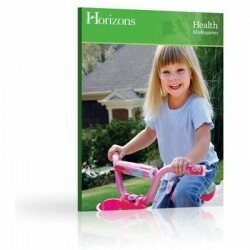 Horizons Kindergarten Health curriculum helps students recognize God's will for healthy living. The teacher's guide has 48 lessons for teaching kindergarteners age-appropriate health themes, such as living in a family, getting along with others, taking care of their bodies, and being safe. The step-by-step lessons in the teacher's guide include a list of needed materials, objectives, background information, lesson overviews, and related activities.